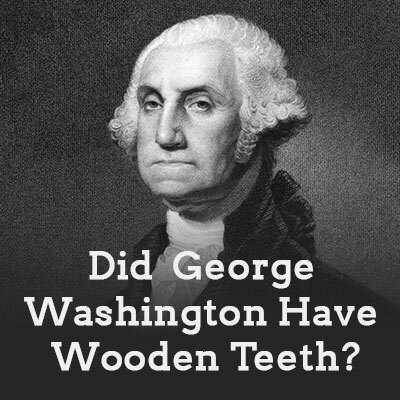 Home › Blog › Did George Washington Really Have Wooden Teeth? When he became the first president of the United States, George Washington had only one real tooth left! You heard right—just ONE. Everyone has heard something about this great man and his dental history, but if you heard that Washington had wooden teeth, then you heard wrong. This myth is totally false—and Dr. Sevey and Dr. Sigwart at Creative Dental Solutions are here to tell you the truth. It was a combination of bad genes and even worse medical practices that led George Washington down the path to becoming toothless. Washington experienced many health problems throughout his life, and he was often treated with “calomel,” a common medicine of his time. Calomel contained mercury, which ruined teeth. The toothpaste of that era was also made from very abrasive materials like tree bark and brick dust, which likely continued to break down Washington’s natural teeth. Many people in Washington’s era had fake teeth, but none were made of wood. As disgusting as it sounds today, rich citizens at the time were able to purchase real human teeth to fill in their own smiles. Washington’s personal diary records frequent sore teeth, inflamed gums, and even his first tooth extraction for 5 shillings at the young age of 24. By the time Washington lost the rest of his teeth, he was rich enough to get a very fancy set of his own dentures – which contained no wood at all. Washington’s dentures were made of a combination of human teeth, cow teeth, and ivory from elephant and hippopotamus. His dentures also included gold, lead, and metal springs. How’s that for a mouthful? It was important to Washington’s self-esteem that he had the total appearance of a strong, healthy leader, and he believed it was important for the reputation of his new nation, too. Historical letters show Washington begging his dentist to be sure that his dentures wouldn’t be obvious with a closed mouth. Sadly, Washington went to great lengths to keep his mouth closed, so he rarely laughed or smiled. Not only were his dentures high maintenance (needing regular care from a dentist) but they also caused his mouth a lot of pain. It is believed that Washington’s dentures negatively affected his leadership because he avoided public speaking. Washington’s wife, Martha, started off with strong teeth but eventually needed dentures herself. Inspired by the oral problems both she and her husband suffered, Martha was always sure to take good care of her children’s oral hygiene. Take Care—Before You Need Dentures, Too! Did you know that 20-30% of all adults in the US have gum disease severe enough to threaten loss of their teeth? If you do need dentures or implants, we can certainly help. But we’d also love to help you keep your teeth in the first place. Bangor locals, come see us for all of your dental care needs. Contact us today for the best chance of keeping all your natural teeth!